A reception is being held in our 3rd Floor open space before the lecture at 3:30 PM. All are welcome. The class action settlement with Google is breathtaking in scope, groundbreaking for publishers and authors, and trailblazing for intellectual property in general. Mr. Sarnoff will address the wider landscape of the agreement, talk through various issues in its negotiation, and highlight some of its more salient points. For all of the hysteria surrounding such digital media developments as piracy and ebooks, the primary implications for books of digital technology reside in two large buckets–discovery and consumption. As publishers, we must encourage the widest possible digital discovery for books while ensuring the best possible commercial prospects for the usage (or “consumption”) of those books across both print and electronic markets. When these two goals overlap, there is an interesting line-drawing exercise to be done, which can lead to pioneering new access and commercial models. A major line has now been drawn, and as publishers and authors negotiating a settlement with Google, we attempted to balance a variety of interests–including of educational institutions, libraries, scholars, researchers, and readers, without jeopardizing the intellectual property rights and serving the interests of a multifarious group of publishers and authors. All of those diverging interests have created a challenging road to settlement, but in the end, the agreement will enable the parties to serve far wider interests than any conceivable legal ruling from the courts on the original copyright dispute. The Google settlement, if approved by the judge, will create vastly expanded access to–and a vast new market for–millions of books which are not in the public domain. Today, when a reader or researcher tries to find and read to an out-of-print book, it is a labor intensive task–particularly if their library does not have a copy available in the stacks. 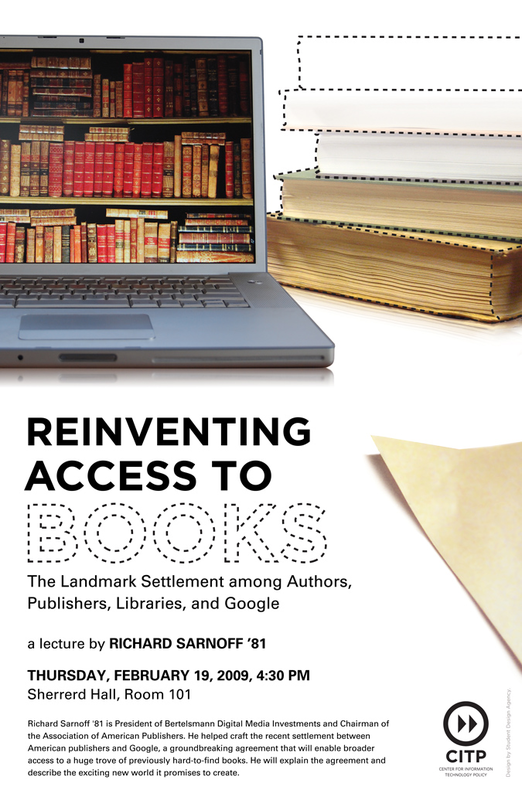 This settlement will change all that with a tremendous expansion of access to millions of out of print, in-copyright books from the collections of major U.S. libraries: a vast storehouse of human knowledge, experience, and imagination. Under the settlement agreement, readers in the U.S. will be able to search these books and preview them on line, and to purchase access to them if they so desire. If a university or college procures an institutional subscription, it will allow for full on-line access to the text of those books by students and faculty through that institution’s servers: a multi-million title collection which can be searched, accessed, read, printed, copied, and cited by students and faculty from any location. Thus, the agreement creates an innovative framework for the use of copyrighted material in a rapidly digitizing world, enables broader access to a huge trove of previously hard-to-find books, and establishes an attractive commercial model which offers both control and choice to rights holders. The implications for the future of scholarship, for libraries, and for the publishing industry are far-reaching. 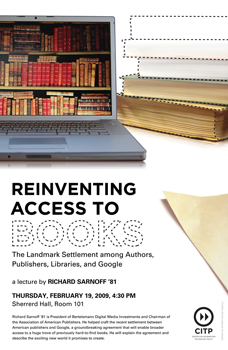 Richard Sarnoff currently serves as Chairman of the Association of American Publishers, and in that role was an architect and lead negotiator of the Google settlement. Concurrently, he is Co-Chairman of Bertelsmann, Inc. the US holding company of Bertelsmann AG, Europe’s largest media company, and President of Bertelsmann Digital Media Investments (BDMI). With revenues in excess of $20 Billion, Bertelsmann is one of the world’s foremost private companies, with holdings such as Random House in publishing, RTL and Fremantle in television, Arvato in media services, and Gruner and Jahr in magazines. A longstanding senior executive in Bertelsmann’s US book publishing operations, Mr. Sarnoff played a key role in the Random House acquisition in 1998, and subsequently served as its EVP and CFO. In the ensuing years, he was additionally responsible for Random House’s New Media and Corporate Development activities, and created and oversaw Random House Ventures. In 2002, Mr. Sarnoff became the first US executive to Chair the Bertelsmann Management Representative Committee and serve on the Supervisory Board of Bertelsmann AG. In recent years, Mr. Sarnoff has established and led Bertelsmann’s digital media investing arm, with offices in the US, Europe and Asia, built an active portfolio of more than fifteen companies. Mr. Sarnoff holds a Bachelor of Arts degree from Princeton University and an MBA from Harvard University. Mr. Sarnoff serves on the Board of Directors of Activision Blizzard, Inc. as well as not-for-profit organizations including the Center for Communication, Princeton University Press, and the Bronx Lab School.